I’ve been running marathons or half-marathons since the Carter Administration. In fact, I completed my first marathon with the late great Kim Johnson in 1979, when he paced me through all five boroughs of the Big Apple in the New York City Marathon. Since then I have run marathons in Chicago, Washington, DC, and Memphis. I’ve been a regular member of “Team McKinnon,” a group that runs the St. Jude Marathon or half-marathon every year in memory of the late Tyler McKinnon, a wonderful young man who was a neighbor of mine and a long-time St. Jude patient who lost a courageous battle to cancer several years ago. Because of my aching back, I was not able to run the half-marathon this year. I walked it with my good buddy Roy Herron. Roy is not simply a veteran marathoner. He is an ironman. 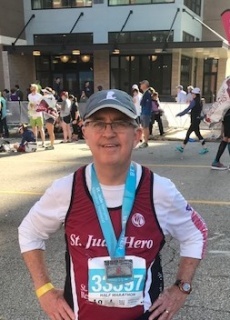 On several occasions over the years, he has not only completed a 26.2 mile marathon, but on the same day has swam one and a half miles and biked over 100 miles. But on Saturday, Roy was kind enough to walk with his old buddy with an aching back. It took Roy and me four hours to walk 13 miles. Along the way we shared stories, laughed, and occasionally teared up as we talked about the friends we have lost over the years. At mile 4, a woman in the crowd yelled, “Hey, Bill!” and I looked and I saw Barbara McKinnon, the mother of my young friend Tyler. I gave her a hug and then thought about Tyler. He was a baseball pitcher, a basketball player, and an Ole Miss Rebel fan. As I used to kid him, 2 out of 3 ain’t bad! He lived only 16 years, and at his funeral, nurses who had treated him at St. Jude gave his eulogies and talked about what a kind and gracious young man he was. I do not know why the good Lord above has let me live 66 years while Tyler went to Heaven at the age of 16. I feel the same way. If Mother Teresa can express frustration about tragedies in life, so can I. But while there are so many things about life and fate and destiny that I do not understand, I know this. On Saturday morning, after the rains and thunderstorms had passed, I spent four hours walking with a good friend, sharing stories along the way, and giving my friend Tyler’s mother a hug. It was a day that made me thankful to be alive. Bruce Williams: God has left you here for the same reason he left George H.W. Bush. You remind us that we can be better people than we allow ourselves through small-mindedness to be. I am honored to count you among my friends.